Robots are usually expected to be rigid, fast and efficient. But researchers at EPFL's Reconfigurable Robotics Lab (RRL) have turned that notion on its head with their soft robots. 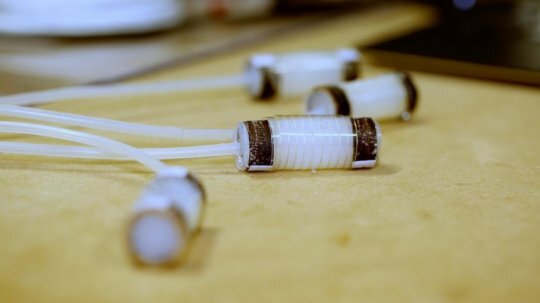 Soft robots, powered by muscle-like actuators, are designed to be used on the human body in order to help people move. They are made of elastomers, including silicon and rubber, and so they are inherently safe. They are controlled by changing the air pressure in specially designed 'soft balloons', which also serve as the robot's body. A predictive model that can be used to carefully control the mechanical behavior of the robots' various modules has just been published in Scientific Reports. Potential applications for these robots include patient rehabilitation, handling fragile objects, biomimetic systems and home care. "Our robot designs focus largely on safety," said Jamie Paik, the director of the RRL. "There's very little risk of getting hurt if you're wearing an exoskeleton made up of soft materials, for example" she added. In their article, the researchers showed that their model could accurately predict how a series of modules -- composed of compartments and sandwiched chambers -- moves. The cucumber-shaped actuators can stretch up to around five or six times their normal length and bend in two directions, depending on the model. "We conducted numerous simulations and developed a model for predicting how the actuators deform as a function of their shape, thickness and the materials they're made of," said Gunjan Agarwal, the article's lead author. One of the variants consists of covering the actuator in a thick paper shell made by origami. This test showed that different materials could be used. "Elastomer structures are highly resilient but difficult to control. We need to be able to predict how, and in which direction, they deform. And because these soft robots are easy to produce but difficult to model, our step-by-step design tools are now available online for roboticists and students.